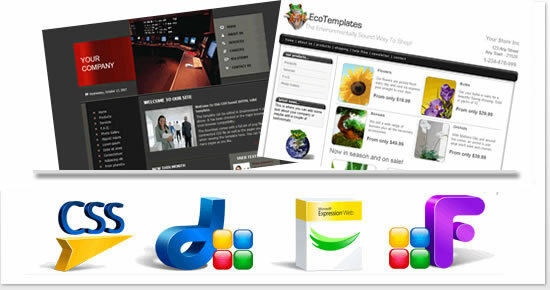 Dreamweaver templates, responsive designs and Frontpage, Expression Web, CSS and wordpress website templates. Our website templates allow you to achieve a professionally designed web site while saving you a great deal of time and money. Purchase and download our Dreamweaver, Frontpage, Expression Web, CSS, Responsive Designs, Wordpress or ecommerce website templates, then use them as a learning tool or to get your site going in a hurry. XHTML valid CSS responsive design layouts. Professionally designed website templates utilizing a combination of Dreamweaver templates and library functions to get your web site underway quickly and easily. Responsive Designs will adapt to the size, resolution and orientation of the viewer’s screen - this means they'll look great on your home computer, laptop, tablet and smartphone. XHTML valid Expression Web templates. The Microsoft Expression Web templates can be edited in Frontpage 2003 or Expression Web and use a dwt file for global updates. Our CSS templates are all XHTML valid and come with .png and/or .psd files. They can be edited in any HTML editor. Our website templates are independent of HTML editor and come with the Photoshop (PSD) source files. They are all XHTML Valid. Our shopping cart software templates will get your products selling in a flash. Shopping cart integrated with Dreamweaver, Frontpage, CSS and Expression Web templates. Microsoft Frontpage 2000, 2002 or 2003 required. WordPress templates you can use to set up a great looking WordPress based site.. Use them to set up a new WordPress site or change your existing theme to one of our exciting designs. Frontpage themes, include pages and FP's navigation structure make it very simple to set up a professional web site in no time using one of our range of templates. Try and buy versions are available for Dreamweaver and Expression Web. Check out our reseller program and earn 20% commission on all templates sold through your site - that's over $30 per sale for our ecommerce plus templates.